Ozeki VoIP SIP SDK gives you the opportunity and all the background support to build your own call center solution. This article introduces call center client applications so you can learn the terms and the main concepts of this topic. Then you can switch to development pages for source codes and guides to start develop your solutions with Ozeki SIP SDK. A call center is a centralized office used for the purpose of receiving and transmitting requests by telephone. A call center can be operated by a company to administer incoming product support or information inquiries from customers. Your representatives will record the caller's name, company, telephone number and any additional information that you have requested, or that the caller wishes to leave. Outgoing calls for telemarketing and other purposes are also made. Implementing a call center is an ideal option for both smaller and bigger companies. This way, your company will convey an impressive corporate image through your business call center. 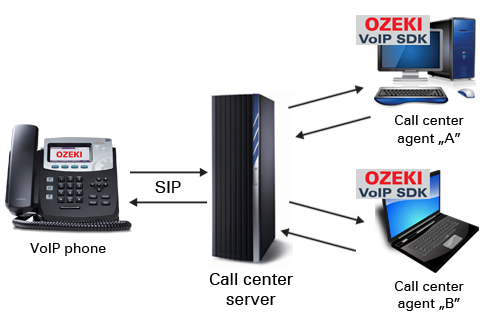 Ozeki VoIP SIP SDK will provide you a call center solution customized even to the special needs of your company. Call center clients (Figure 1) are the applications your representatives will use after integrating a call center solution in your business. Employees will be able to accept incoming customer-calls by using these clients. They will sit on front of a computer, with a headset (combination of speaker and microphone) on their head, and can answer to customer questions and needs in an easy and comfortable way. Call center calls first run into the call center server. This server will forward the calls to the call center clients. This transfer can be an attended call transfer or a blind call transfer. Attended call transfer refers to that the call is forwarded to a predefined destiny. Blind transfer on the other side means that the server chooses a client to forward the call to according to an algorithm that was built in the system. The name of the transfer algorithm is 'call routing'. Call routing is a set of rules that defines the method according to which the server chooses the client to answer the actual call.